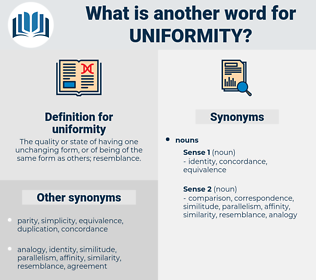 What is another word for uniformity? The quality or state of having one unchanging form, or of being of the same form as others; resemblance. 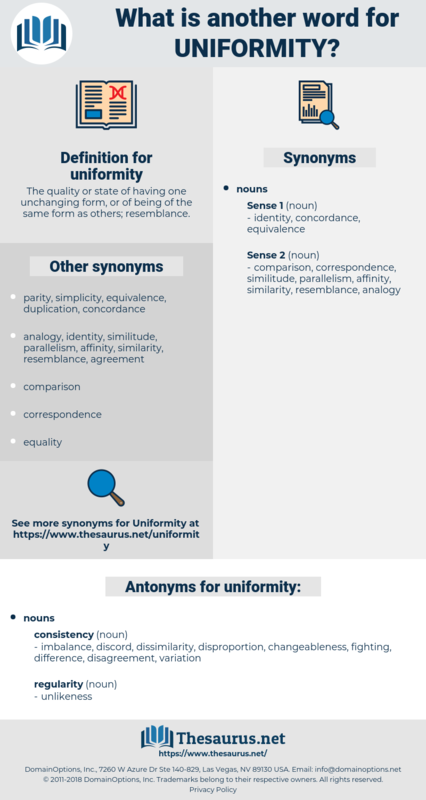 harmonisation, conformity, unanimity, comparability, re-unification, cohesion, similarity, cohesiveness, unitary, unify, monotheism, consolidation, harmony, standardizing, uniforme, convergence. unity, coherence, standardisation, commonality, consistency, unevenness, evenness, inconsistency, homogeneous, compatibility, alignment, integrity. imbalance, discord, dissimilarity, disproportion, changeableness, fighting, difference, disagreement, variation. controversy, variance, battle, warfare, dissension, disunion, opposition, hostility, nonuniformity, schism, contest, incongruity, contention, separation, antagonism, conflict, inconsistency. There is undoubtedly a place for practice, though not before performance, and uniformity was undoubtedly the germ of an ideal.